Abbey Cheese – Produces organic sheep cheeses in the Midlands, near Portlaoise. Setup by Pay Hyland in 1991, and is best known for its creamy brie and feta style (St Canice) cheeses. Ardrahan– from Kanturk, in County Cork this farm makes semi-soft cow’s milk cheese in plain and oat smoked forms. Bandon Vale– Also from Cork, this is a commercial cheese producer making a range that includes Vintage (mature nutty cheese), Murragh (Irish cheddar) and Glandór (mellow Red Leicester). Baylough– Hard pressed and waxed, aged cheese made with milk from a herd of both Friesians and Red and White Dutch cows. They make oak-smoked and plain flavors as well as fresh garlic. Beal Organic Cheese– The organic dairy farm of Beal Lodge is located in County Kerry and the make organic Farmhouse Cheeses and yogurts. It is one of about 25 organic dairies in Ireland. They have a pedigree herd of Holstein cows producing 2 kinds of cheese- Wensleydale style Beal cheese and a cheddar style. Bellingham Blue Cheese– soft blue cheese made with raw cow’s milk at the Glyde Farm in Castlebellingham, County Louth. Blarney– Made by Kerrygold, Ireland’s most famous butter producer, Blarney cheese (named after the famous Castle in County Cork) is a mild, semi-hard cheese made from cows’ milk. Comes in a low-fat version. Bluebell Falls – Located in Charleville, Co Cork and owned by the O’Sullivan family, produces organic handmade goats cheese with a herd of over 150. Cheeses include Orion, a semi-hard and Cygnus Pepper, a cheese flavored with garlic, herbs and black pepper. Blue Rathgore– a full vegetarian blue cheese made from goat’s milk in Northern Ireland, in County Antrim (a beautiful region where you will find Dunluce castle and the spectacular Giant´s Causeway). Boilie– These much loved little fresh cheese curds are actually hand-rolled and come in glass jars filled with oil and herbs. They can be used in salads or spread on Irish soda bread, delicious. Made at the Ryefield Farm in Bailieboro, Co. Cavan. Burren Gold– This cheese is made in the unique Burren region in County Clare. Friesian cows graze on wild grass and herbs in the fertile valleys in between the rugged limestone hills, producing milk that comprises this Gouda-style cheese. The cow’s milk is unpasteurized and a farmhouse cheese as such. The cheeses are also flavored with Nettles & Garlic, Fenugreek seed, Black pepper, Cumin, and oak smoked. Cahills Irish Monastic Cheeses– 3rd generation, family-owned, artisanal cheesemakers, located in County Limerick. They are known for their Irish Whiskey Cheese (vintage cheddar) made with Kilbeggan Whiskey. The range of cheese includes Cahill’s Kilbeggen Irish Whiskey, Ardagh Chalice Wine Cheese and Ballyporeen Cheese with Irish Herbs. Carlow Farmhouse Cheeses– These cheeses are Edam style, cheeses made with raw milk from a single dairy herd. They come in plain and flavored (Sundried Tomato, Basil garlic, Nettles & Dried Onions, Black Pepper, Chili, and Cumin) styles. Carrigaline Farmhouse Cheese – Another very popular cheese in Ireland, Carrigaline has a very buttery texture and is an artisan cow’s milk semi-soft cheese made by Ann and Pat O’Farrell in County Cork (Carrigaline) at the “Rock” (under the shadow of the castle in ruins). Wonderful natural cheese, a “must buy” while in Ireland. Carrigbryne Farmhouse Cheese– see “St Killian”. They also make Irish Brie & St.Brendan Brie. Cashel Blue– Blue Roquefort style cheese made in Tipperary by the Grubb family, this is probably Ireland’s most famous cheese and is well known internationally. Used in all of Ireland’s top restaurants and featured in numerous cookbooks. Clonmore Goats Cheese– Distinctive hard goat´s cheese made by Tom and Lena Biggane in Charleville, Country Cork (relatively new company). Adored by Irish cheese fanatics, Clonmore is gaining international attention quickly. Coolea Farmhouse Cheese– Gouda-style cheese made with aged cow’s milk in Coolea, in the scenic hills that border the counties of Cork and Kerry. Founded by a Dutch cheesemaker and now run by her son, Coolea is well established as one of Ireland’s classic cheeses. Corleggy Farmhouse Cheese– The farm is located on the bank of the River Erne, between Cavan and Fermanagh counties. Quivy and Corleggy are their goat´s cheeses and the cow´s milk cheeses include Drumlin Traditional, Garlic, and Red Pepper, Cumin, Smoked, and Green Peppercorn. Cratloe Hills Cheese– Sean & Deirdre Fitzgerald make fantastic sheeps´ cheese at this farm in County Clare, halfway between Shannon and Limerick. They make two kinds of cheese- mild (nutty and semi-hard) and mature (hard and drier), both with 100% sheep’s milk. Croghan– Soft and hard raw goat’s milk cheese made in Blackwater, County Wexford, overlooking the Irish Sea. Crozier Blue– Made in Tipperary county by the Grubb family (Cashel Blue), this is an artisanal, semi-soft, blue cheese made from sheep’s milk. Derreenaclaurig– True artisan cheese made by Harry van der Zanden in the dramatically atmospheric Kerry village of Sneem. The tiny production is made with milk from his own Jersey cow herd. 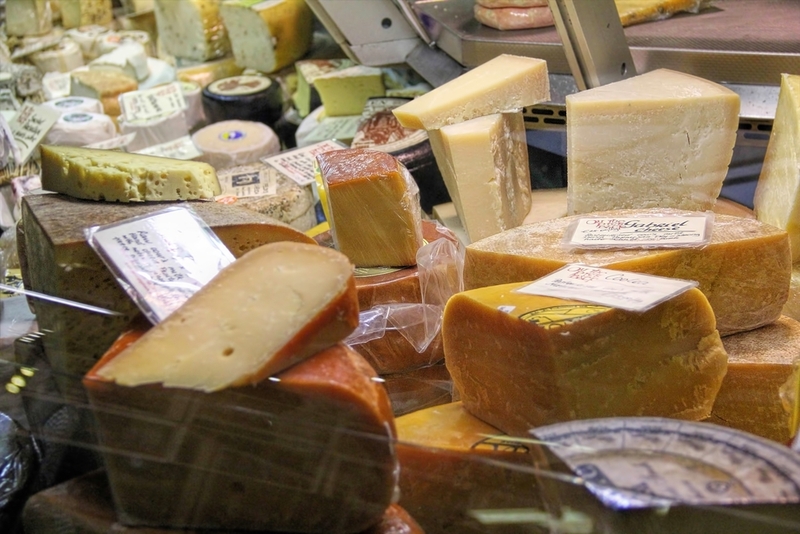 The range of small production cheeses from plain, aged, cumin flavored, garlic flavored- almost all are sold in local farmer’s markets and restaurants. Derrymore Cheese– Farmhouse cheese made in Claremorris County Mayo. Dingle Peninsula Cheese– Terrific cheese from a beautiful corner of Ireland (made in Kilcummin Beg, Castlegregory, in County Kerry). Very unique in that the raw cow’s milk cheese is flavored with seaweed! Owners Maja Binder and Olivier Beaujouan are well known and well-loved personalities in Ireland’s foodie scene and their cheeses are very recommended. Dubliner – Ireland’s most widely sold cheddar ironically not made in Dublin at all, but rather in Ballineen (West Cork) by Carbery Natural Cheese. The cheese is matured for 12 months and has a rather sweet flavor (as opposed to a sharp cheddar). Durrus Farmhouse Cheese – this award-winning cheese is made in a stunning corner of West Cork, near the hamlet of Durrus and the super Good Things Café. Owner Jeffa Gill was one of the artisan cheese pioneers of Ireland, along with Giana Ferguson of Gubbeen, and has been making fabulous cheese since the late ’70s, way before it was in fashion. Durrus is round, semi-soft and made with cow´s milk then aged. Fermoy Natural Cheese (Cais Dubh)– yet another cheese company in County Cork, Ireland’s artisan food epicenter, Frank and Gudrig Shinnik make a Gouda-style cheese called Cais Dubh. Gabriel– made in gourmet hotspot Schull in West Cork. Hard, raw milk cheese, reminiscent of Gruyere with its wheel shape and texture. Fruity! Bill Hogan and Sean Ferry of West Cork Natural Cheese make this and the equally wonderful Desmond cheese. Gleann Gabhra – Is an award-winning artisan Irish cheese producer owned by Dominic and Fionnuala Gryson. The farm is located near the historic Hill of Tara in Macetown County Meath. Gleann Gabhra produces a mild white colored goat’s cheddar, which won gold at the 2010 British Cheese awards. Glyde Farm Cheese – The Thomas family has been producing Bellingham Blue cheese since 2000 near Castlebellingham, Co Louth. This is a fully flavored blue cheese is made from raw milk produced from their close Friesian herd. Their cheeses have won many awards including Ireland’s Supreme Cheese award, and the Best Blue Cheese in the British Cheese Award. Gubbeen – Mythical cheese producer (as well as charcuterie from their smokehouse) Giana and Tom Ferguson are true culinary pioneers in Ireland. Their pretty farm is located in West Cork just outside the picturesque hamlet of Schull and they make both smoked and unsmoked artisan cheese with cows milk from their own herd. Don’t leave Ireland without bringing Gubbeen with you! Their products are 100% top class. Hegarty´s Cheddar– Dan and John Hegarty’s famous cheddar is made with their own Freisan herd’s milk in Whitechurch, Co. Cork. Excellent. Killeen Farmhouse Cheese– This gouda style cheese is made by Marion Roeleweld (who is also a traveling cheese consultant for brands like Mossfield Organic Gouda) at the Killeen Millhouse in Ballyshrule (County Galway in Connemara). They make goat’s cheese, plain cow’s milk cheese, and herb and garlic flavored cheese. Killorglin Cheese – Originally fro Holand Wilma Silvius makes a Gouda-style cheese on her farm in Kilorgan, Co Keery. She uses milk produced from Holstein cows on her husband’s farm. Wilma likes to flavor her cheeses with cloves, fenugreek, seaweed or garlic, and ages them for a min of 6 weeks. Knockalara – feta-style award-winning cheeses made in County Waterford near Cappoquin, by Wolfgang and Agnes Schliebitz. The range includes Dromana Natural; Pepper; Sesame and Fine Herbs then the Waterford Feta and Knockalara Sheep’s cheese (which also comes packed in olive oil). Knockanore – Eamonn and Patricia Lonergan have been making this award-winning cow’s milk cheese in Ballyneety, County Waterford for over 20 years. Their cheeses are adored by connoisseurs throughout the Emerald Isle and come in many styles- Plain, Garlic and herbs, Garlic and chive, Red, Black pepper and chive and Oak smoked. Knockatee Cheese – Peter Ireson moved to Co. Kerry from the UK in the mid-1990s. He produces four styles of cedar cheeses bound in cloth and sealed with butter at the Knockatee farmhouse. His cheeses are aged for a minimum of 10 months, producing some of the most sought-after Irish cheddars. Knockdrinna – Boutique cheese producer in Stoneyford, County Kilkenny making a wide variety of cheeses from cow´, goat and sheep milk. That includes Knockdrinna Gold Goats Cheese, Knockdrinna Meadow Sheep’s Cheese, Lavistown Cheese (which they have taken over; this is a long established Irish farmhouse cheese), Knockdrinna Snow, Knockdrinna Fresh Pesto with Goats Cheese, Knockdrinna Fresh Goat Log, Knockdinna Goats Greek style soft goat´s cheese. Macroom Cheese – Back in 2009 Johnny & Geraldine Lynch imported 31 buffaloes from Italy. They are the first producers on buffalo mozzarella in Ireland. They are grown the herd now to over 75 and their cheeses are sought by the restaurants and eateries in Ireland. They produce Buffalo Mozzarella, Greek Style Feta cheese, and Haloumi. Milleens– A stunning Irish farmhouse cheese (cows milk), made in the beautiful Beara Peninsula, West Cork. Mine-Gabhar– Organic cheese made by Luc and Anne Van Kampen. Mount Callan– This cheese company was founded by Michael and Lucy Hayes in 2000 in County Clare. The aged cheeses are made with cow’s milk from their own herd of Montbelliard cows and are produced in summer via a traditional cheddar method. Oisin Farmhouse Cheese– Organic goat’s milk cheeses made at a farm run by Rochus & Rose van der Vaard in County Limerick. Old McDonnell’s Farm– Located in beautiful Glen of the Downs in Wicklow, this farm makes all kinds of products including goat’s milk cheeses. Orla – Made at the Manch Estate in Ballineen, County Cork, this cheese is organic, unpasteurized, and semi-hard made with sheep’s cheese. They also make ricotta. St Tola Goat´s Cheese– from County Clare, these are both hard and soft goat’s cheese following the French tradition. Very popular and used in many top Irish restaurants. St Killian– this Camembert style cheese is made by the Carrigbyrne Farmhouse in County Wexford with raw cows milk and vegetarian rennet. Wicklow Blue– John & Bernie Hempenstall make this delicate blue brie in the gentle countryside of County Wicklow. How can we determine if any of the cheeses are from other than Holstein cows. There were several Irish breeds of cattle; are there any cheese manufacturers that use cattle other than Holstein cows?